Like so many others yesterday, I watched the tragedy in Boston unfold on the news – standing with co-workers in the lunchroom, mouths covered in horror, heads shaking in disgust, eyes tearing up in sadness at yet more lives lost and damaged beyond repair. The act of one person ruining the lives and hopes and dreams of so many. What was supposed to be a triumphant celebration of achievement, a joyous occasion of accomplishment shattered by unspeakable violence. More questions of what can we do, more fear of where we can go, and more disgust at the actions of cowards. Our country mourns yet again; this time with another city, with another demographic, over another type of violence. I think any writer with a modicum of a platform, no matter how small it may be, would be remiss in not addressing this attack on some level. The part I need to address is hope. Yes, hope. Since the advent of social media, anyone with access to the internet can voice their opinion publicly, can share their thoughts and feelings and words. And so very much of what I saw on Facebook and Twitter yesterday was, for the first time in a long time, simply support. From tweets simply reading, “My thoughts and prayers go out to everyone involved in the tragedy in Boston,” to statuses sharing from all over the world, “NY Loves Boston,” “Dublin’s Heart is With Boston,” to pictures of the Boston skyline, to entire articles depicting the emergency personnel and civilians alike running toward the injured instead of away from the chaos. The helpers. 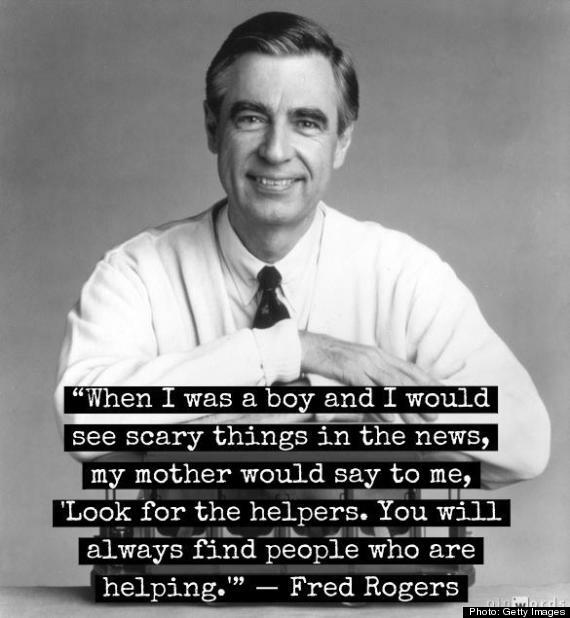 The picture and words I saw the most yesterday were that of the beloved Mr. Rogers, who said this, “Always look for the helpers.” What phenomenal advice. Look for the helpers. Look for the ones who are doing what they can to make a horrible event bearable. There were so many yesterday. The exhausted runners who should have been celebrating the culmination of years of hard work with an ice bath and a chair continuing to move, to push wheelchairs and help people up and give blood. The people of the city of Boston opening their homes and hearts to those stranded in a strange city that had just been attacked, no questions asked. The restaurant owners giving out free meals without regard to their bottom line. Google setting up a site to help frantic family members find their loved ones. The emergency personnel; the doctors and nurses and fireman and police and EMT’s and servicemen who have dedicated their lives to helping being put to the ultimate test and stepping up once again. The list goes on and on. Smartphones make it almost frighteningly easy to immediately share pictures and videos without censure; many of us saw some raw video footage of people with limbs blown off, puddles of blood, and tearful horror within minutes of the explosions. But so much of what I saw yesterday gave me hope. These videos were unscripted; this was real life and real reactions, and so much of it showed helpers. These are real people. This is the real world we live in. In the midst of explosions and terror and unknown, these were real people that did everything they could to help. And that is what our country is made up of. Helpers. We’ve shown it over and over and over again, in New York and Pennsylvania on that dark day in 2001, in Newtown just before Christmas, in Boston yesterday, and countless other times; there has always been more helpers than evil. There has always been more love than hate. We just need to remember it. There’s many who will say I’m being naive, that I’m trying to find the rose-colored lenses for a pair of broken glasses. I’m okay with that. Because I’m right. I may not always remember it, but we’re surrounded by helpers. Try using my rose-colored glasses – you’ll see it too. Instead of the sadness of the homeless person on the corner, you’ll see the helper who drops a quarter in his cup. Instead of the frustration of a crowded bus, you’ll see the helper give up his seat for a tired mom. Instead of anger at being stuck in a long line, you’ll see the helper patiently counting out change for the elderly person at the front. And instead of pure evil in a time of terror, you’ll see the helper in not only the people in Boston that physically risked themselves, but in the millions of us around the world who did what little we could to show our support. To help. Mr. Rogers was a smart man. Always, always look for the helpers. They’ll be there. We’re with you, Boston. Kudos to all of your helpers.